Fireworks at the Avon Pier. 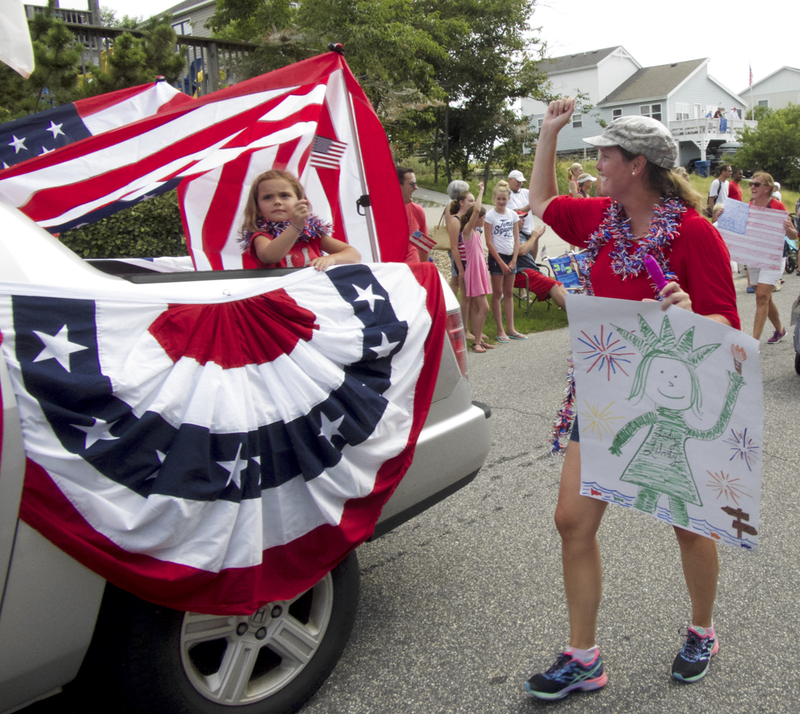 Four firework displays, two community fairs and one parade…the goal: go to as many Outer Banks July 4th events as is possible. The method: I was hoping for the North Beach Sun would spring for thirteen-and-a-half hours of helicopter time. No such luck. Had to rely on my car. Marching in the Town of Duck 4th of July Parade. 8:30 a.m. Duck Road. We’re creeping along at 2-3 mph. Really, there’s a couple pushing a baby carriage that seems to be making better time than we are. I’ve did shave some time off the drive by taking the SUPER SECRET ROUTE THROUGH SOUTHERN SHORES. But now I’m stuck with everyone else until … something happened—we’re up to 6mph. And there’s a parking place. I cut across the Scarborough Fair parking lot to Christopher Street and wait for the parade. There are a few thousand people standing around, waving flags, lot of red, white and blue; all the kids—as far as I can tell—have bags, anticipating a rich haul of candy. The Duck Independence Day Parade has to be experienced to be understood. The early evidence that this is a parade with different rules comes when the first organized group following the presentation of the town banner is 35 or 40 dog owners—with dogs of course. Organized may be the wrong adjective here since dogs seem to have a very different view of precision marching than humans—but march they do in their own way. What really seems to set the Duck Parade apart for any other and makes it so much fun, is that it appears as though the only criteria to participate is to tell the town you wish to be a part of the parade. There are family groups; there are businesses; a juggling unicyclist…and, of course fire trucks. 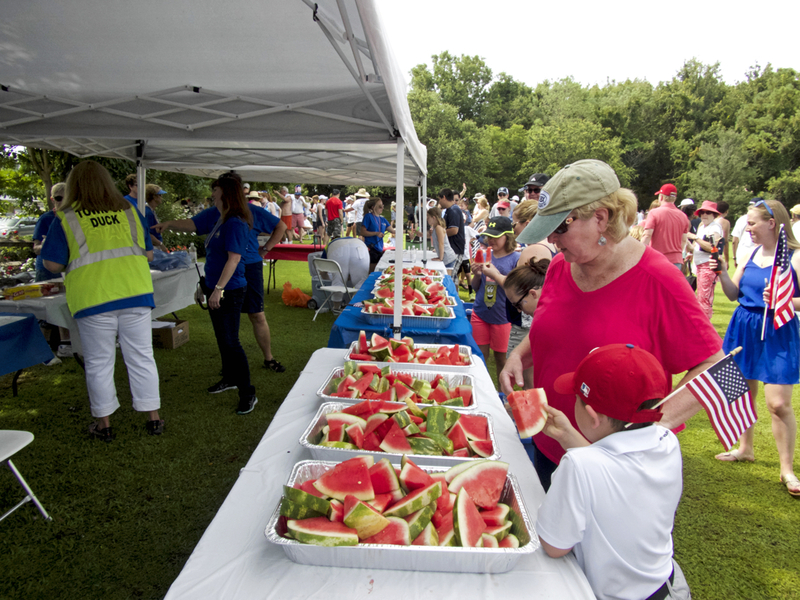 Free watermelon for all after the Duck 4th of July Parade. The parade lasts about an hour, maybe. Then it’s over to the Town Green for watermelon and water for the adults and popsicles for the kids. Lots of watermelon. Some farmer is probably putting the down payment on a tractor right now after selling the crop to the town. Hoofing it back to the car wondering where my helicopter pilot got to. Go home and download 200 plus pictures. 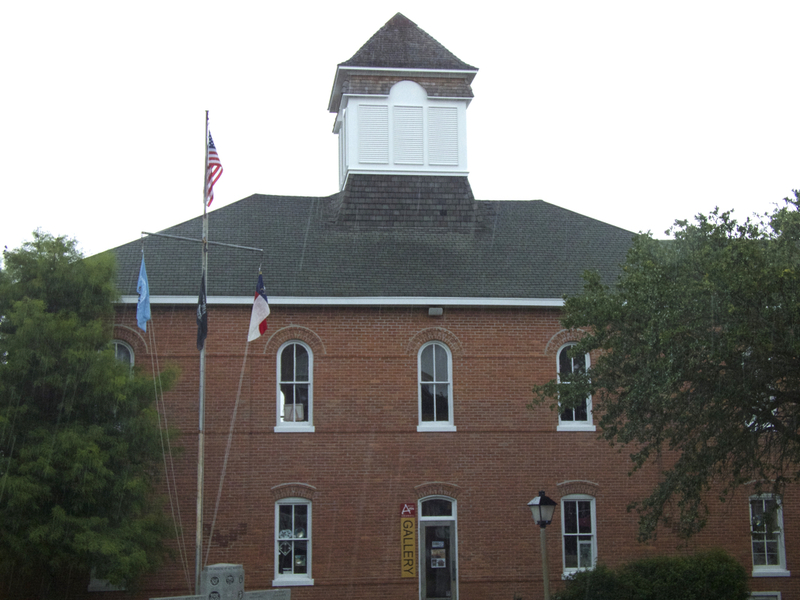 Grab a bite to eat and then it’s off to Manteo. The rain and thunder early on at the Manteo celebrations. The streaks in the image are the rain drops. It’s not quite 2:00 and they’re still setting up, so a scoop of ice cream and a double shot of espresso at Big Bucks Ice Cream to kill some time, and I like their ice cream and the espresso is very good. Poke my head outside and there’s a Star Spangled Banner contest occurring on the street in front of the old Dare County Courthouse—not really a contest since it’s more about just singing the song. A difficult song to sing. I was standing under the wrong walkway. The people next to me were under the walkway in front of Big Bucks. They were dry. I was not. It’s a little after 3:00 and the rain is letting up enough that I can get back to my car, but it’s a wet walk. I know the rains let up later, but without my helicopter to whisk me from location to location, I can’t afford to take any chances. A quintessentially all-American celebration at the Whalehead Club. A little bit of a break between Manteo and the Whalehead Club because I got home at 4:00 and the Whalehead Club events don’t begin until 5:00. Fashionably late to the Whalehead Club—about 5:45 and the parking lots were already almost full. Amazing—that’s the only word to describe it. The setting is sublime, the music from Tidewater Drive Band perfect for the day, lot’s of fun games for kids, a couple of barbecue places and a fish fry—just about everything that goes into an all-American celebration. There are families on lawn chairs and blankets. 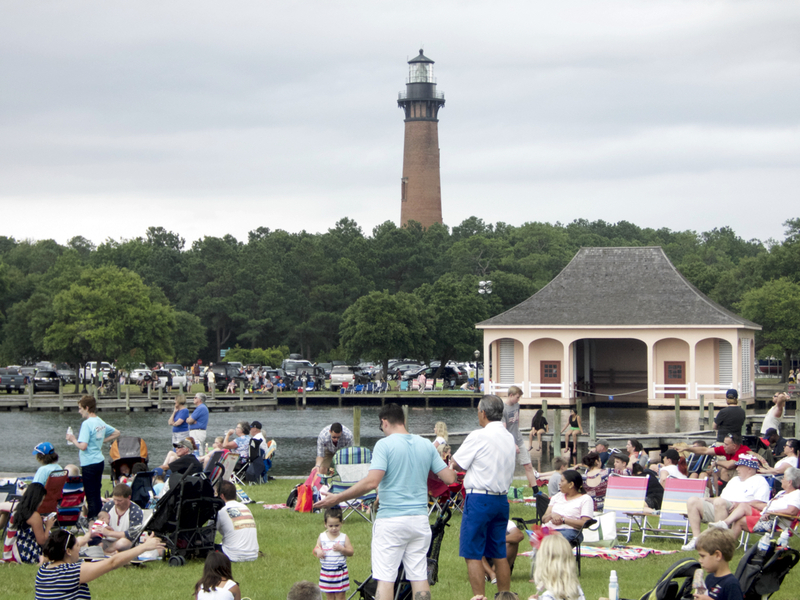 The Tidewater Drive Band song list leans on soul and hit tunes from the 60s and 70s. There must be something about soul music because when they break into Respect little kids are dancing, young adults are into it and a couple of teenagers are moving to the music. And the older adults are tapping their toes in rhythm. 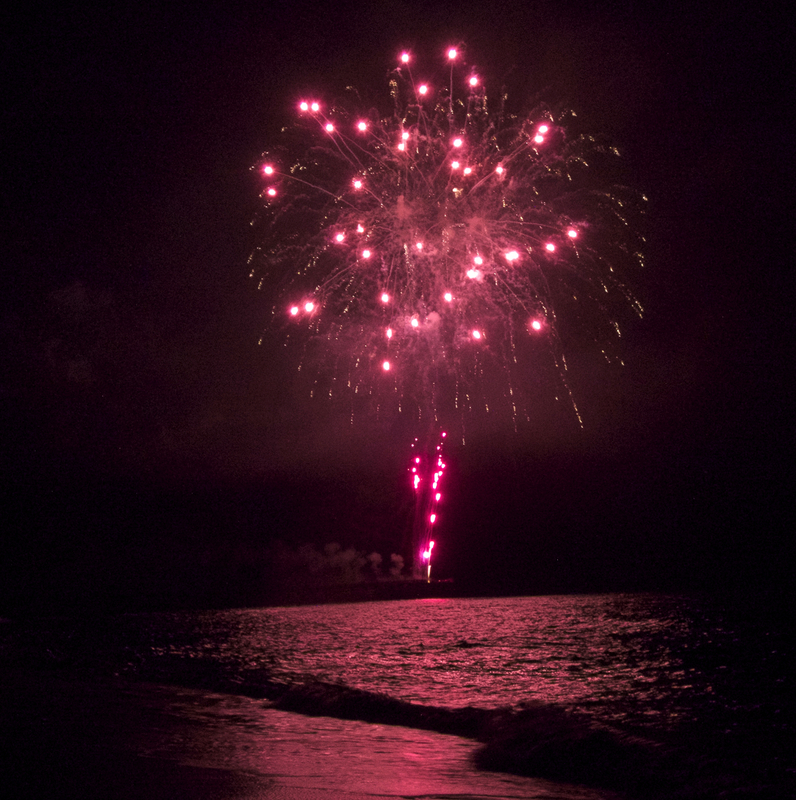 Fireworks reflected on the waters of the Atlantic Ocean. Still no sign of the helicopter so it’s drive south and decide whether it’s going to be Kill Devil Hills or Nags Head. I decide on Kill Devil Hills, only because it’s closer. In theory, I could sit directly between Avalon Pier and Nags Head Pier and have the best of both worlds, but that would put me 2.75 miles from either one and that seems a bit far. What I really want to know is, Where is the helicopter so we can take aerial shots? I listen carefully but don’t hear the distinctive “chop, chop, chop,” of helicopter blades cutting through the air. I don’t even try to park anywhere near Avalon Pier. The KDH police have three blocks protected for pedestrians crossing the street and a steady stream of families coming from the west side of the Bypass tells me all I need to know about parking. I pass the Mariner Days Inn, find a place to park and head to the beach. Everywhere I look, there are sparklers waving around, Roman Candles lighting up and bottle rockets whistling into the night. Actually walking along the beach does take a certain amount of awareness since I’m not sure if the bottle rocketeers are aware of anything other than the rockets. As I’m walking along I meet a young man from the Ural Mountains of Russia who is working at Mulligans for the summer. He mentions that he’s studying to be a petroleum engineer. He did mention that one of the problems with petroleum is that some day it will run out. Interesting observation. I should have asked him more about that. I also should have asked if he had been in the US before and if this was his first 4th of July. About a quarter mile from the Avalon Pier I stop and wait. There is just a hint of daylight left to the west; the ocean is calm tonight, the waves gently crashing onto the shore they receding. Suddenly there’s a loud whistle and a BANG and the first firework lights the sky. It is a spectacular way to celebrate our nation’s birthday—a moment when, in spite of the many differences that exist among us, we can watch as the sky is painted in exploding shades of red, white and blue and remember that there is in fact, much more that unites us than divides us. 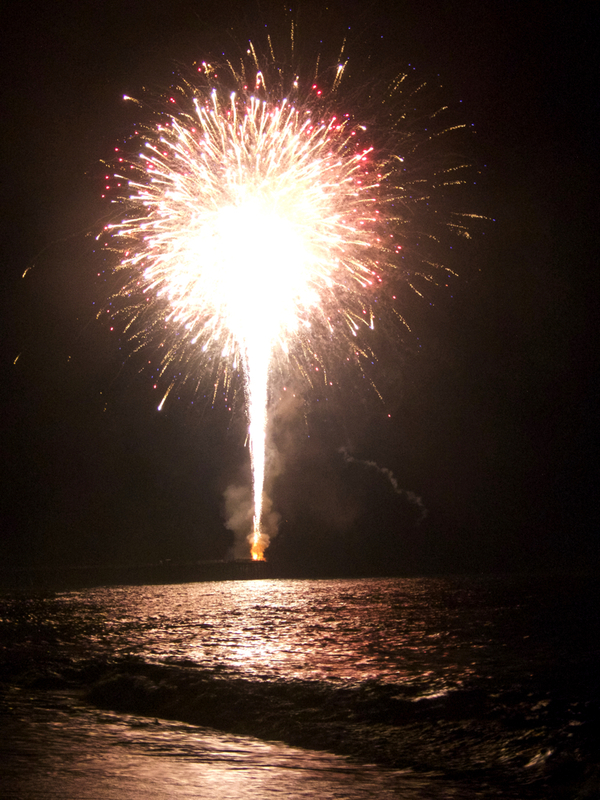 We didn’t quite get around to lighting bonfires on the Outer Banks, but here on this end of the continent, it was a grand illumination.